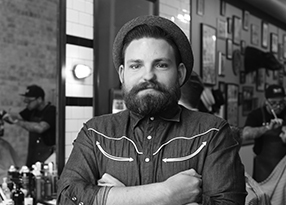 Scotty, or “Scissor Slinger”, as he’s know to his large clientele and within the barber industry is one of the owners of The Alibi Room. The Alibi Room is located in the heart of the steel city of Newcastle. The shop specialises in traditional barber cuts and cutthroat shaves. A relaxed haven away from the hustle and bustle of city life. Scissor Slinger encourage’s a social connectivity amongst his customers, friends and other barber’s in the area. By the very definition of it’s name, The Alibi Room has created a space away from home, work or school enriching a comaradory in his neighbourhood. The design of his barber shop was inspired by the 1920’s American Prohibition Era. With New York City subway tiles, art works that adorn the walls exposing a rich history of tradition and passion that is the craft of barbering from yesteryear. The Alibi Room’s attention to detail, heritage and authenticity is reflected in his barber shop and represented in his work. The Alibi Room offer’s the connection of traditional style barbering to the modern day gentlemen, without being old fashioned. Scissor Slinger pride’s himself on quality service and uses only the best international and locally made mens grooming products available.